WCQ603 The Fabulous Big Red and The Boys! Amy is doing some decorating and having some challenges with her Christmas lights. She is very excited to have Meghan "Big Red" Murphy and John Francisco on her couch singing some songs from their holiday show. Guest: Meghan Murphy, AKA Big Red, and John Francisco join Amy to bring holiday cheer (and songs) to the Queercast. Meghan and John are 2 of 4 performers in the holiday show, Big Red and the Boys at Theatre Wit. These two share some stories of their annual holiday traditions plus what albums are a "must listen to" each season. They are performing only 5 shows, so get your tickets NOW! 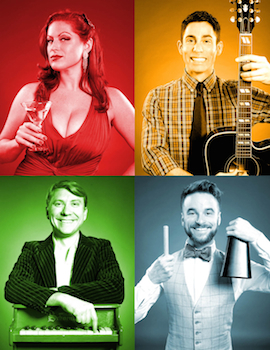 Music Featured on This Queercast:Meghan Murphy and John Francisco - "Wonderful Life", "Bad Girls" and "Hard Candy Christmas"
Photo Credit: BIG RED and THE BOYS (clockwise from upper left) Meghan "Big Red" Murphy, John Francisco, Patrick Andrews and Nick Davio. Photo by Timmy Samuel.